Sometimes I think I should’ve become an Astronomer. I love to look at the sky. I love the clouds in the day. I love the stars at night. God’s vast creation never ceases to move me. But the moon is not creating that light by itself. It is reflecting the light of the sun. On it’s own, the moon could never produce any light… ever. On it’s own, the moon is just a cold rock floating aimlessly in space. In fact, the only way we can even SEE the moon is because of the sun. Just as the moon reflects the sun, we are to reflect the Son! When people look at you, they are supposed to see Christ. We transform and radiant God’s warmth, love and compassion. When Moses saw God, he glowed. His face shone so much that he was forced to shroud himself so he wouldn’t scare people. And Moses only saw a glimpse of God’s back! (Exd. 34:29-35). Not to sound too corny, but: Wake up and Shine! 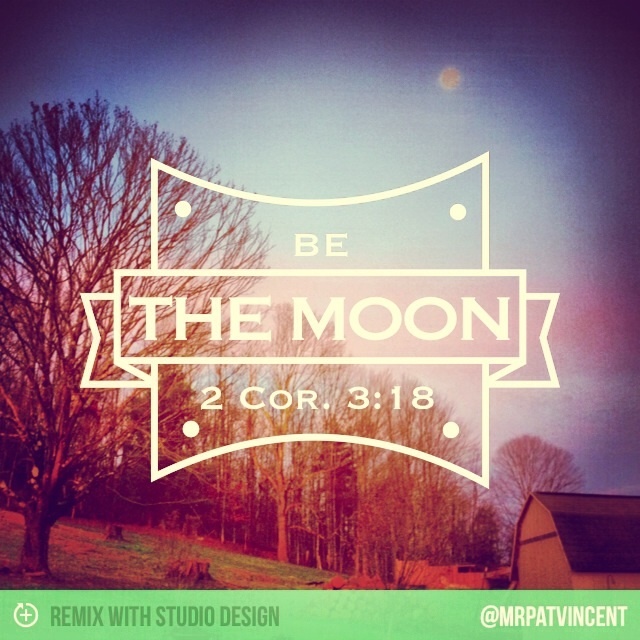 BE THE MOON! This entry was posted in Christian and tagged Beaver Moon, Bible, blessed, Charles Stanley, cheerful giver, Christ, Christian, Christianity, church, David, Earth, Faith, Farmers' Almanac, Full moon, giving, God, God Bless, God Loves You, God's love, Heart of David, Holy Spirit, HolySpirit, Hope, Jesus, Jesus Christ, liveforJesus, Lord, Love, Luke, Moon, Moses, Not a Fan, November, prayer, Psalms, Religion, Religion and Spirituality, Salvation, Scripture, small blessings, spiritfilledlife, spiritualwarfare, Test, Wordpress, Worship. Bookmark the permalink.